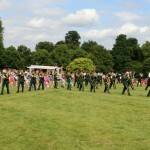 You are browsing the Blog for Recent Highlights Archives - Page 2 of 2 - Romford Drum & Trumpet Corps - Marching Band. 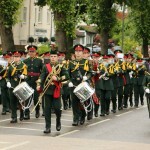 With the event running over Saturday and Sunday, the bands involvement began on Friday with us setting out in the afternoon to reach Colchester for a rehearsal with all of the bands involved. The journey wasn’t without its “entertainment” – just after passing Chelmsford we had to pull over…. the coach had died and we were stuck in a lay-by. After a 90 minute wait for a replacement coach we were on our way, again, to Colchester. 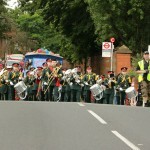 Arriving late, the band jumped straight into action got on with the job and within a matter of minutes, all involved had forgotten that we were less rehearsed – it certainly didn’t show. Saturday morning, and it was an early start to be up and travel over to The Abbey Field where the event was being held, although the weather wasn’t looking too promising. 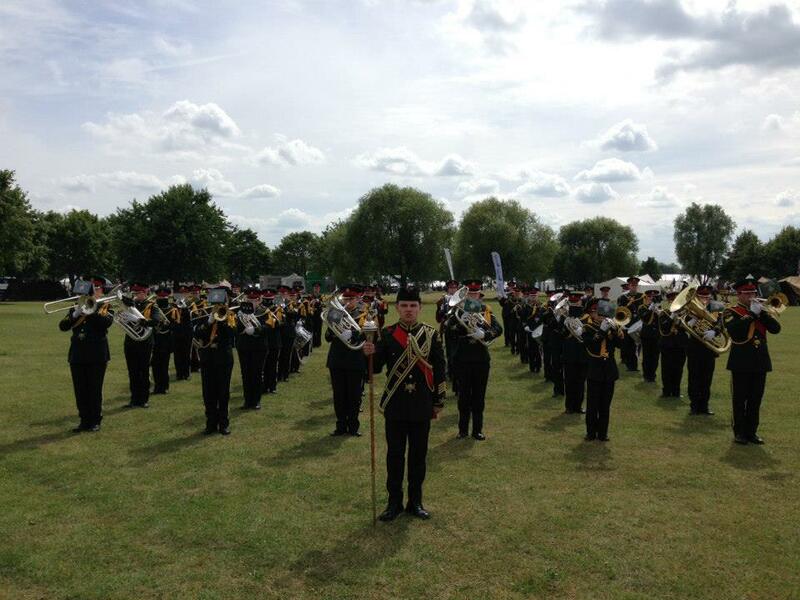 With the rain just about holding off for most of the day, the band had 2 performances in the morning – A display with The Band of The Brigade of Gurkhas and later a finale Massed Bands performance – and a second 2 in the afternoon (a repeat of the morning performances). 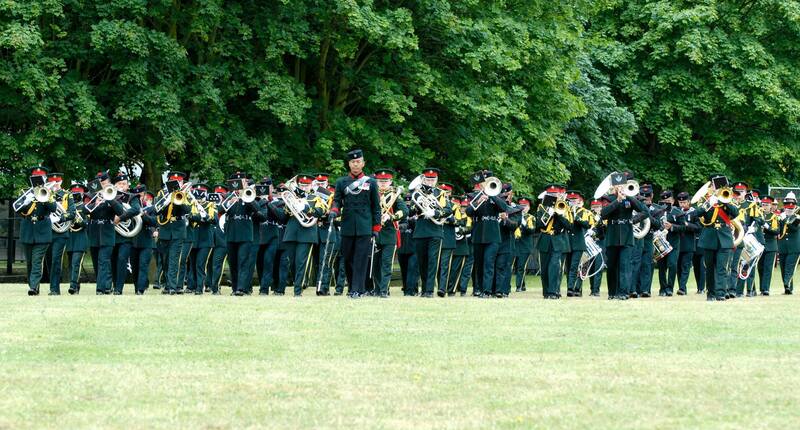 At this point, it seems important to mention that the Ghurkhas march at 140 beats per minute (BPM) compared with the usual 120bpm – its safe to say we had a challenge on our hands, although our prior rehearsals had pushed us past that speed to make sure it wasn’t a shock on the day. 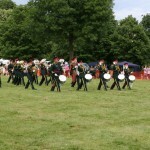 Sunday followed much the same pattern but with a slightly improvement in the weather, and each performance from all of the bands were progressively sharper each time. Although it was slightly tiring with the 4 performances each day, and a rough start to the trip, it was certainly thoroughly enjoyed by all. 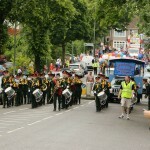 The band returned for another year at the Carshalton Carnival which was this year themed around the Rio Carnival. Samantha first began studying music at The Ursuline Preparatory School in Brentwood, where she learnt recorder and piano. 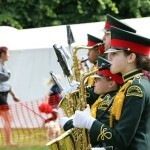 She later developed this musical interest by taking up the violin, saxophone and drums at The Cooper’s Company & Coborn School, in Upminster where she was awarded a Jack Petchy Award for Music in 2009. In June 2013 Samantha graduated from Colchester Institute with her BA (Hons.) in Music. 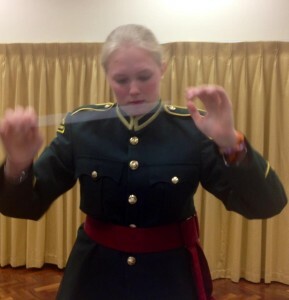 Whilst in her second year studying at Colchester she was a winner of the Concerto Competition. Throughout her time at school and university Samantha has been a part of many different musical ensembles as a performer and conductor, ranging from playing for musicals, saxophone quartet ‘One Screw Loose’, Dixie group ‘TradJazzled’ and larger scale organizations such as Symphonic Wind Orchestras and other local youth bands. In September 2013 Samantha began her Master’s in Music at the Trinity Laban Conservatoire of Music and Dance in London, where she has been awarded one of the college’s postgraduate woodwind scholarships. 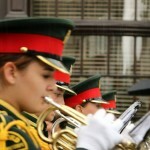 She currently studies with some of the top musical professionals in the country. 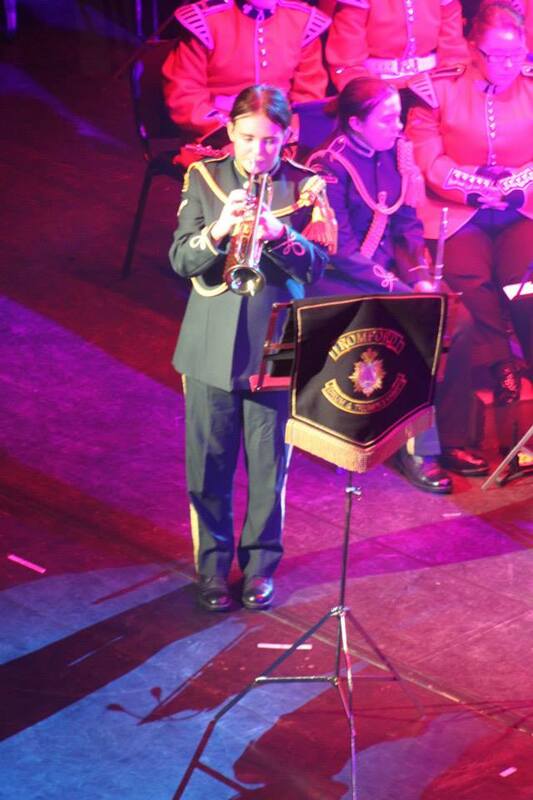 Samantha’s passion for music and helping others around her develop their abilities further led her to begin working with the Romford Drum & Trumpet Corps as a conductor in January 2014. 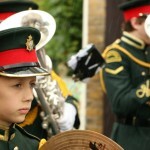 The Romford Drum & Trumpet Corps ensures it gives its members the best help to nurture the talent within the youth band. In May 2014 the band gave Samantha the title of Musical Director which she was delighted to accept and looks forward to the future working with the band. 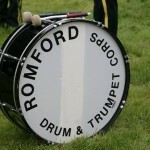 The Romford Drum and Trumpet Corps took up their usual position at mile 23 of the Marathon, in front of The Tower of London, to encourage the runners and entertain spectators for the day. With the weather on our side and some new pieces lined up, the day was thoroughly enjoyed all round. The day started off with the usual hurdle of setting up the marquee – it seems to be an unwritten rule that 1 piece goes missing each year and the poles change lengths. A few hits and misses later, we got there although the weather was on our side this year and gave us some much welcomed shade. The band kicked off in time to play for the elite runners passing through and continued for the rest of the day giving a much needed boost for many of the runners. An in between pieces we carried on the good spirits by cheering on the names of any of the runners who looked like they needed some help. We spotted a marching band taking part in the marathon this year (with instruments) which has given us an idea for some point in the future….. 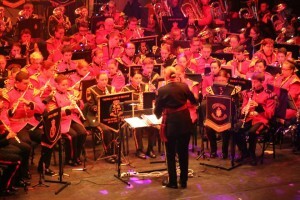 The Romford Drum and Trumpet Corps was delighted to be invited along as a guest band at this year’s Rorke’s Drift Concert in at the Theatr Brycheiniog in Brecon, Wales – The 17th Annual Concert to be precise. The trip started out for the Band on Thursday evening with some rehearsals and social time over the next few days, ready for Saturday night’s performance at the Theatr Brycheiniog. 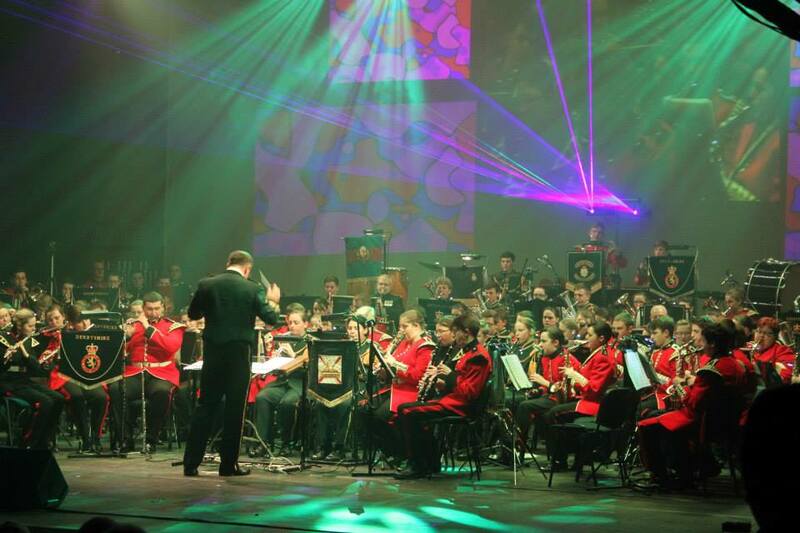 The performance included approximately 160 young musicians as part of a massed band of the Army Cadet Force (ACF), hosted by the ACF band of the Gwent and Powys ACF. The performance opened with the English and Welsh National Anthems before the programme moved towards some fantastic pieces of music including: “A Selection from Mary Poppins”, “Colonel Bogey”, “The Simpsons”, “The Gael”, “The Edge of Glory”, “Solitaire” and “High on a Hill”. The programme also featured “Feeling Good” (as made famous by Nina Simone, and later recorded by Michael Buble) with an absolutely outstanding Trumpet solo from our very own Daisie Foreman. Of course, no performance of ours is complete without a display by our drum section which this time, encompassed 3 of their best tattoos and was enhanced with a light display and pyrotechnics!